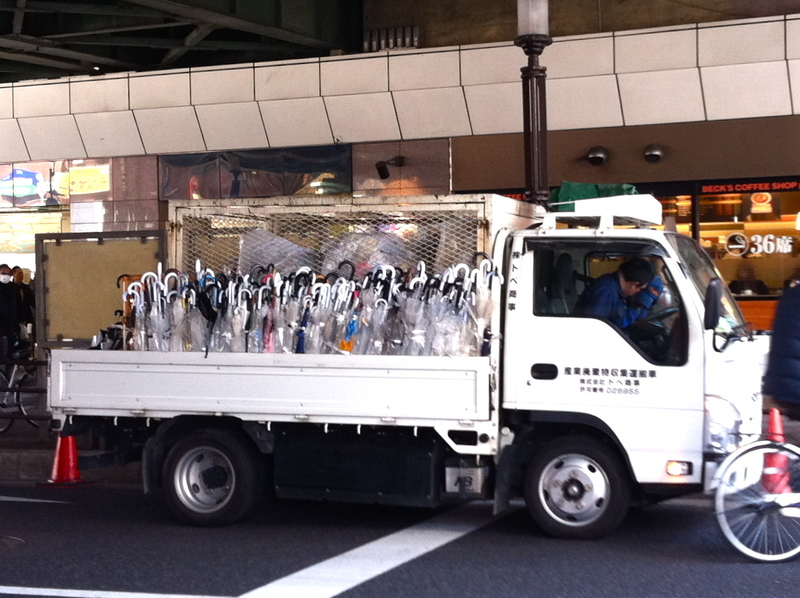 Like the carts that went around plague-stricken Europe in the dark ages, this truck was parked in front of Takadanobaba station today, carting away all the blown-out, abandoned umbrellas left behind after last week’s rainstorm. Why so many? you may ask. Notice that almost all of them are the telltale clear ¥500 variety bought by hapless individuals who forgot to check the weather report and got caught far from home without a bumbershoot. These umbrellas are worth every yen you pay for them, which is to say that they fall apart after only a few uses. But how to get rid of a broken umbrella? The garbage police are so strict, they certainly won’t cart away a defunct umbrella if you put it out at the curb on non-burnable garbage day, because it’s longer than 30 cm. So the most common solution is to stick the broken one in the wet umbrella rack outside a convenience store, go in and buy a new one, and “forget” to take the old one home with you.